The surface to surface 2000 km range Ballistic Missile AGNI-II was successfully flight tested for the Strategic Forces Command (SFC) at 8:46 A.M from Wheeler’s Island in Bay of Bengal off Coast of Odisha. The two stage solid propellant AGNI-II launched as a part of regular strategic Forces Command (SFC) exercise as they reached the pre-designated target point in Bay of Bengal within accuracy of few meters. Two ships located near the target point have tracked the terminal phase of the vehicle and witnessed the final event. The Radars and Electro-Optical Tracking stations have tracked and monitored the vehicle and all the relevant parameters. All the systems, Propulsion, Control, Actuators, On-Board Computers, Missile Interface Units and the Navigation, Guidance systems functioned fully to the perfection and ensured the vehicle reached the target within few meters of accuracy. 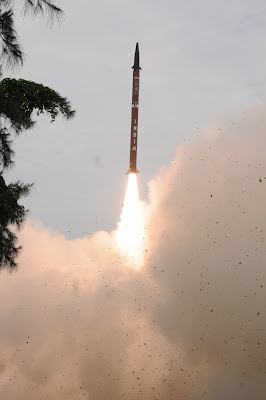 The launch operations were carried out by SFC and the DRDO scientists have monitored and guided all the activities. The teams were led by the Project Director Shri Laxminarayana and the Mission Director Shri Avinash Chander, DS & CC R&D (MSS) who guided and reviewed the activities. Dr. V K Saraswat, SA to RM, Secretary Deptt of Defence R&D and DG (R&D) DRDO were present during the launch and cleared the launch of the vehicle after thorough review.